My second Android application is Risk Odds Calculator. 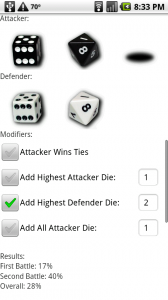 This application will calculate the odds of an attacker winning any single attack in the game of Risk and its variants. 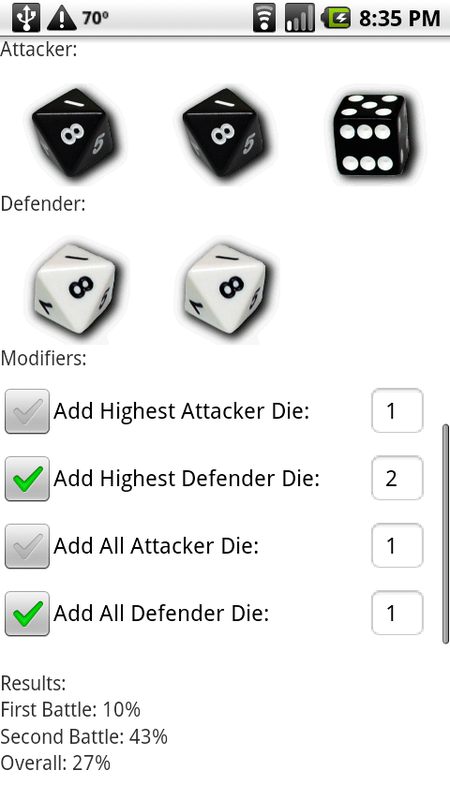 The die selector for Attacker and Defender cycles through 3 types: none (black shadow), six-sided die, and an 8-sided die. 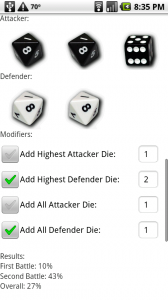 There is also a list of modifiers that allow you to do more advanced calculations for some of the more complicated Risk games, such as Risk 2210 or Risk Godstorm. If there are any modifiers that I missed that you would like to see added, let me know and I will try to add them in. You can download Risk Odds Calculator for free from the Android Market.